It might sound relatively ordinary but there are two game mechanics that caught my attention. First, cards are taken from a row of 9 – only one of the first 4 cards can be taken by a player but if they take any card other than the first card they must put the others before it into their corruption deck. The player with the most cards in their corruption deck at the end of a round will lose some points. Second, the score for your cards is the number of cards multiplied by the total number of scarabs on each (some have no scarabs) which sounds like a good system. Plus, there are more scarabs on the less commonly occurring cards (like ivory) whereas the more common cards (like wheat) have fewer scarabs on them – the mathematical part of my mind likes the balance of that. At the end of the round, sets of cards not played score just their scarabs (and any cards that are not playable as a set at all go in the player’s corruption deck). As well as those two specific mechanics, I like that some cards are characters who can be used for special powers, as well as some special events that the players can trigger. The Swiss-based publisher, GameWorks, seem to put a lot into the visual design of their games – 2-player Jaipur was colourful and clear, and pirate-themed racing game Jamaica is one of the most cohesive visual designs I’ve seen. (Remembering it has a pirate theme, Jamaica’s box looks like a treasure chest and it looks full of gold coins when opened (as that’s what’s printed on the back of the rules). 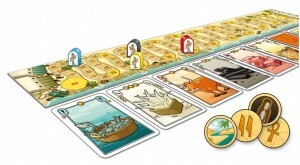 Also, the rules are like a treasure map – both physically and in their layout – and the cards can be laid end-to-end to make one long panoramic scene.) 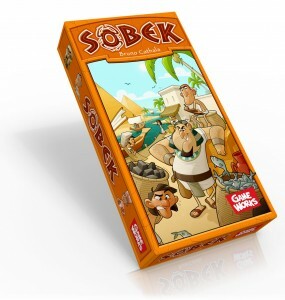 So, I have confidence the physical quality of Sobek will be very good. Overall, it sounds light, fast and fun. This entry was posted on Monday, September 27th, 2010 at 9:05 am	and is filed under Board Games, Essen Spiel 10, On the Radar, Sobek. You can follow any responses to this entry through the RSS 2.0 feed. You can leave a response, or trackback from your own site.